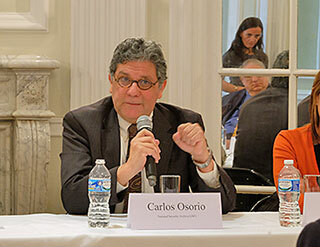 Washington, D.C., May 6, 2015 - The National Security Archive today posted key documents on Operation Condor, presented by its Southern Cone analyst, Carlos Osorio, at a historic trial in Buenos Aires of former military officers. During 10 hours on the witness stand recently, Osorio introduced one hundred documents into evidence for the court proceedings. His testimony was profiled on May 3 in a major feature article published in the Buenos Aires daily, Pagina 12. Operation Condor was an infamous secret alliance between South American dictatorships in the mid and late 1970s - a Southern Cone rendition and repression program - formed to track down and eliminate enemies of their military regimes. 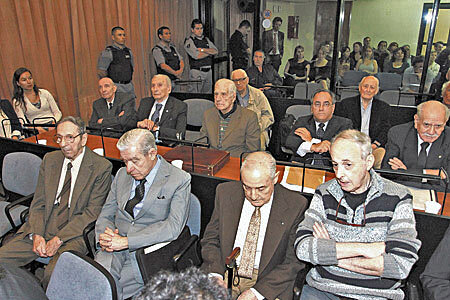 The Condor trial charges 25 high-ranking officers, originally including former Argentine presidents Jorge Videla (deceased) and Reynaldo Bignone (aged 87), with conspiracy to "kidnap, disappear, torture and kill" 171 opponents of the regimes that dominated the Southern Cone in the 1970s and 1980s. Among the victims were approximately 80 Uruguayans, 50 Argentines, 20 Chileans and a dozen others from Paraguay, Bolivia, Peru and Ecuador who were targeted by Condor operatives. "We have been working on Operation Condor for years," Osorio said, "sifting through archives in many continents and building a body of knowledge and a trove of documents." The Pagina 12 feature entitled "The Evolution of Condor," described Osorio’s presentation of "dozens" of documents to the tribunal, and the contribution the documents made in educating the judges on the genesis and evolution of coordinated repression in the Southern Cone. Osorio’s testimony covered a range of topics including the breadth of Condor operations, U.S. knowledge of those operations and the authenticity of the records being introduced into evidence. The article highlighted one document Osorio presented that revealed the bilateral precedent for what would become a multilateral system of regional repression: a secret accord between the Argentine and Paraguayan military intelligence services to "Collaborate in the struggle against subversion…" and the "… internment [of dissenters]…" " The agreement was dated September 12,1972, and signed by Paraguayan intelligence officer Col. Benito Guanes Serrano. Three years later, Guanes would also be one of the five original signatories of the secret Condor accords. Osorio discovered the document in the Archive of Terror in Paraguay. In September 1975, an assessment by a State Department intelligence analyst concluded that "The national security forces of the southern cone surpass the terrorists in cooperation at the international level…" Six weeks later, in Santiago, Chile, intelligence chiefs from Argentina, Bolivia, Chile, Paraguay and Uruguay signed an "Acta" officially establishing Operation Condor. Osorio introduced that pivotal document - provided to the Archive by a source in Chile - into evidence as well. Two declassified U.S. documents presented to the tribunal underscored the contradictory response of high U.S. officials as they became aware of Condor operations in the summer of 1976. 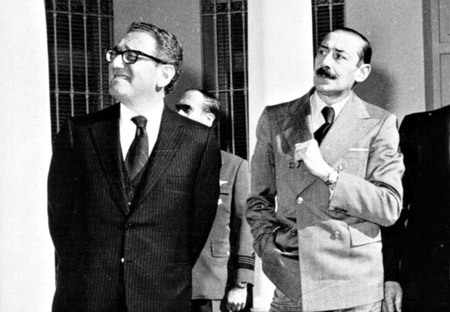 One well-known 13-page memorandum of conversation between Secretary of State Henry Kissinger and Argentine Foreign Minister Admiral Cesar Guzzetti dated June 10, 1976, revealed Kissinger’s endorsement of the regional collaboration to repress the left. After Guzzetti informed Kissinger that the Southern Cone regimes were engaged in "joint efforts" to fight "the terrorist problem," Kissinger essentially supported this approach: "If there are things that have to be done, you should do them quickly. But you should get back quickly to normal procedures," according to the declassified transcript Osorio provided to the court. "We want you to succeed. We do not want to harrass [sic] you," Kissinger concluded. "I will do what I can … "
After a CIA briefing to Kissinger’s top aides in late July 1976 on the Condor countries’ plans to send assassination teams around the world to eliminate opponents, the Secretary of State authorized a démarche to General Augusto Pinochet in Chile, General Jorge Videla in Argentina, and other military leaders in the region calling on them to cease and desist. "Government planned and directed assassinations within and outside the territory of Condor members has most serious implication which we must face squarely and rapidly," stated the secret August 13, 1976, cable to U.S. ambassadors in those nations. But the démarche was never delivered to any of the Condor regimes. After the U.S. ambassadors raised objections about presenting the démarche to the generals, on September 16, 1976, Kissinger rescinded it, and ordered "that no further action be taken on this matter." In September 1972, the intelligence services of Argentina and Paraguay signed a secret agreement to facilitate a "mutual collaboration in the struggle against subversion…" The accord stated that the secret police would "join forces in the exchange of information" to undermine and eliminate subversive groups, and coordinate the "internment [of dissenters]." The accord, according to the document, appears to have been preceded by previous bilateral agreements between the two nations in the area of cooperation in fighting leftists. 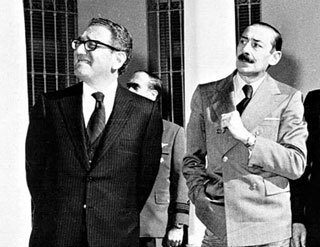 Along with bilateral cooperation between Argentina and Chile after Gen. Pinochet's September 11, 1973, coup, this Paraguay-Argentina arrangement established a precedent and precursor operations for broader multilateral efforts at repression formalized under Condor three years later. This Department of State confidential document records an assessment of terrorist activities around the world, as well as global counterterrorism operations. "In general, the national security forces of the Southern Cone surpass the terrorists in cooperation at the international level," as the analyst at the Bureau of Intelligence and Research, James Buchanan, briefed the Committee to Combat Terrorism. This assessment indicated a high level of regional coordination even before the official inauguration of Operation Condor in Chile in November 1975. Operation Condor was founded at the behest of the Pinochet regime in late November 1975. This summary of Operation Condor's inaugural meeting hosted by the Chilean secret police, DINA, in Santiago, Chile, provides substantive detail on the mission, coordination, communications, intelligence sharing, joint operations and the Latin American intelligence officers involved in initiating a regional effort to suppress the left in the Southern Cone. It also identifies the origins of the name of this cross-border collaboration - Chile's national bird, the Condor. "This organization will be called CONDOR, by unanimous approval of a motion presented by the Uruguayan Delegation to honor the host country," the document concludes. The founding document is signed by five of the highest ranking intelligence officers in the Southern Cone, representing the original Condor nations: Chile, Argentina, Uruguay, Paraguay and Bolivia. (Later Brazil, Peru and Ecuador joined Condor.) The document was originally obtained by National Security Archive analyst Peter Kornbluh from human rights investigators in Chile who discovered it in the Foreign Ministry archives; Osorio's testimony marks the first time it has been formally introduced as evidence for the legal proceedings on Condor crimes in Argentina. "You will have to make an international effort to have your problems understood. Otherwise, you, too, will come under increasing attack. If there are things that have to be done, you should do them quickly. But you must get back quickly to normal procedures." When Guzzetti suggests that "The terrorists work hard to appear as victims in the light of world opinion even though they are the real aggressors," Kissinger agrees. "We want you to succeed," he concludes. "We do not want to harrass [sic] you. I will do what I can…"
This "action" cable was a démarche drafted by aides to Secretary of State Kissinger, instructing U.S. ambassadors in key Condor nations to advise their host regimes not to undertake international assassination missions against selected opponents. It reflects a decision by Kissinger's office to oppose the Condor assassination plots - especially those outside of Latin America - because they would create further human rights condemnation of the Southern Cone regimes. In the démarche, Kissinger instructs the ambassadors of Argentina, Chile and Uruguay to meet as soon as possible with the chief of state or the highest appropriate official of their respective countries and to convey a direct message. The ambassadors are instructed to tell the officials the U.S. government has received information that Operation Condor goes beyond counterterrorism information exchanges and may "include plans for the assassination of subversives, politicians and prominent figures both within the national borders of certain Southern Cone countries and abroad." The ambassadors are ordered to express the U.S. government's "deep concern" about the reports and to warn that, if true, they would "create a most serious moral and political problem." The cable was distributed the last week of August 1976; but after the U.S. ambassadors in Chile and Uruguay raised concerns about delivering this message, Kissinger decided to rescind it. On September 16, he instructed his top deputy for Latin America that "no further action be taken on this matter." Five days later, former Chilean Ambassador Orlando Letelier and his colleague, Ronni Karpen Moffitt, were assassinated in Washington D.C. by a car bomb planted by Condor operatives.